BLAEU - Hortus et Palatium Atestinorum Tyburi. BLAEU, J. / MORTIER, P. - Hortus et Palatium Atestinorum Tyburi. Hortus et Palatium Atestinorum Tyburi. - BLAEU, J. 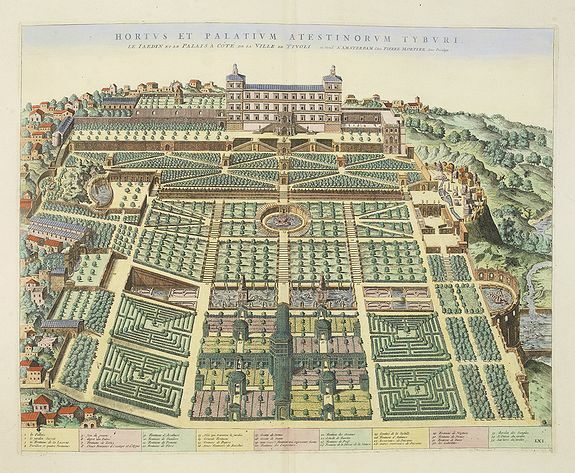 / MORTIER, P.
Title : Hortus et Palatium Atestinorum Tyburi..
Map maker : BLAEU, J. / MORTIER, P.. Size : 17.9 x 22.4 inches. / 45.5 x 56.9 cm. Description :Showing in great detail the hortus and gardens of Villa Tivoli. Joan Blaeu published during his life three town-books of Italy: Citta del Vaticano, Roma and Napoli. By the year 1672 a fire largely destroyed the main Blaeu workshop, and much of the prepared material. However, work on the town-book continued, and in 1682 the completed work was published in Amsterdam by the heirs of Joan Blaeu. The town-book was a great success and reissued several times by different publishers in Amsterdam, as late as 1726. Pierre Mortier re-issued all the Blaeu plates in the years 1704/1705 in an atlas comprising four volumes. The plates are now signed A Amsterdam chez Pierre Mortier. Condition : A nice and attractive impression.